In the past, I’ve served bacon wrapped asparagus as an appetizer, and I thought I would do a variation of that for breakfast. I’m the type of cook that primarily gets inspiration from what happens to be in the refrigerator, and this time I had a ton of asparagus, but no bacon. I did however have some pancetta and prosciutto, which are more flavorful than bacon in my opinion, so I went for it! You can prepare your eggs however you like best, but I would recommend poaching or frying. 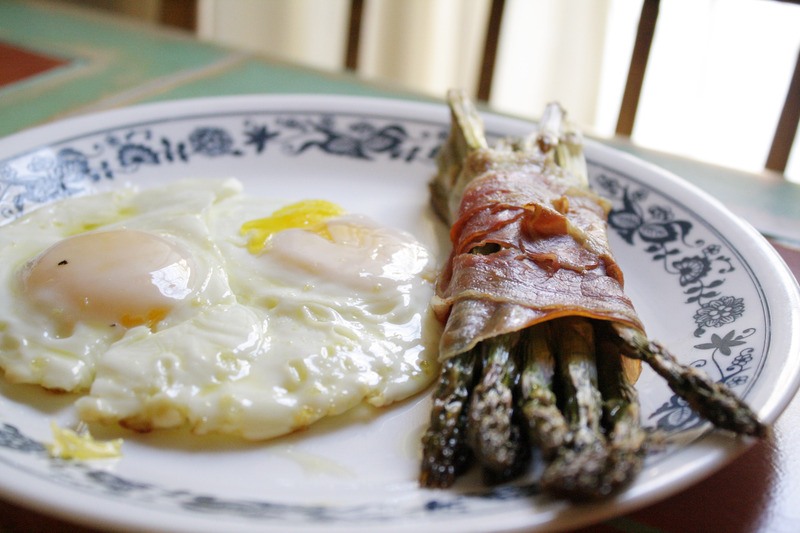 I love the way the runny yolk melds together with the asparagus and toasted salty meats. The prep itself was fairly quick and easy. I simply separated the asparagus into bunches – whatever size/amount you would like per serving, keeping in mind that it will shrink down a bit as it cooks. I then wrapped the asparagus with one piece of pancetta and one piece prosciutto, drizzled some olive oil and a tiny amount of salt over it, and baked in a 350F oven for about 15 minutes. I served this up with some fresh coffee, opened the curtains to let the sunshine in and had a lovely breakfast with my boyfriend who ate it all up. I cannot wait to make this one again! Yum!! And a perfect pairing with eggs too!